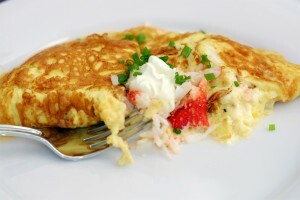 Cheese Omelette recipe by maham at DesiRecipes.com. Heat the butter over high heat in a small skillet until foamy. Meanwhile, beat together the eggs, heavy cream, salt and pepper. Whisk the mixture with a fork to incorporate as much air as possible. Pour the egg mixture in the skillet and swirl it around a bit so it is just ever-so-scrambled. Now wait. Don’t do anything for at least 45 seconds. Using a silicone spatula, scrape around the edges of the pan to loosen the egg from the sides. Tilt and swirl the pan to allow the runny, uncooked egg on top to drip down underneath the cooked parts. Add the cream cheese at this point to one side of the pan and cook for another 30 seconds to a minute. Using your silicone spatula, fold the opposite side of the eggs over the cheese. Gracefully slide the whole thing onto a plate. Top with a sour cream and some chives.